Will you be using your local town centre next week? A Scotland’s Towns Partnership-led campaign, Scotland’s Towns Week aims to raise the profile of Scotland’s towns; uniting, inspiring and supporting towns across Scotland, to run or launch activities during Scotland’s Towns Week. This video includes comments taken at the latest Cross-Party Group Meeting on Towns and Towns Centres from the Minister for Towns Derek Mackay, Jim Metcalfe, Carnegie UK Trust, myself and others on the importance of Scotland’s Towns and Scotland’s Towns Week 2014. 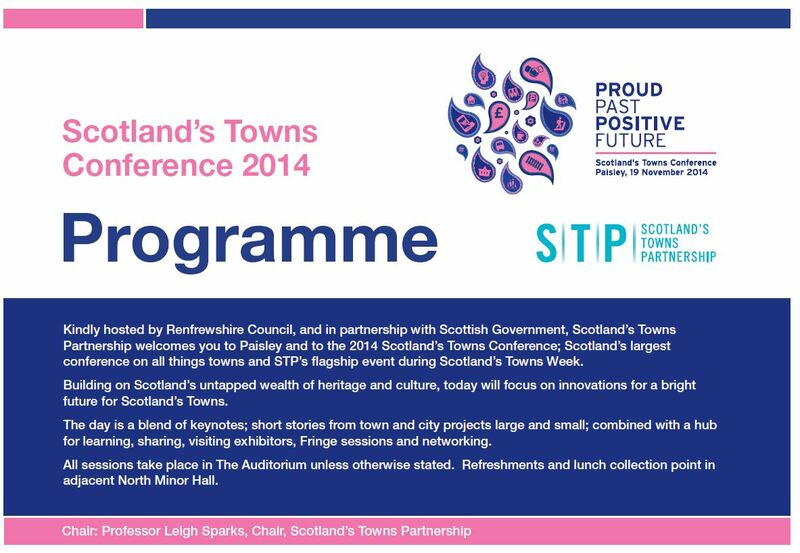 Scotland’s Towns Week flagship event, the annual Scotland’s Towns Conference is being held in Paisley this year on 19th November 2014, with around 150 key stakeholders whose interests lie with Scotland’s towns. The programme is available below, as are details of the exhibition and fringe events. The day starts with a keynote from the Towns Minister, Derek Mackay, reflecting on the Town Centre Action Plan and looking forward to initiatives and excitement in Scotland’s Towns in the coming year. With a host of other presenters, discussion sessions, delegates from various towns, learnings from progress on various town centre demonstration projects, and opportunities for discussion, debate and learning, the day promises to be another interesting and useful one. I will try to put up a summary and some reflections soon after the conference. It would be good to see you at the conference, but whether you can attend or not, if you can, get out and use and enjoy your local town centre during the week. This entry was posted in Entrepreneurship, Government, High Streets, Innovation, Localisation, Public Realm, Regeneration, Scotland's Town and High Streets, Scotland's Towns Partnership, Secondary Locations, Town Centre Action Plan, Town Centres and tagged Demonstration projects, Local, Paisley, Scotland's Towns Conference, Scotland's Towns Partnership, town centre, Town Centre Action plan, Towns Week. Bookmark the permalink.